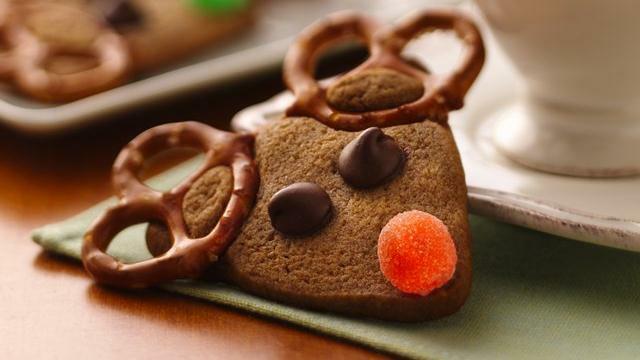 Sure to be the hit of the holiday cookie plate, these reindeer cuties are fun for children to help make. With thin sharp knife, cut dough into 32 (1/4-inch-thick) triangular slices; on ungreased cookie sheets, place 2 inches apart. Place 2 pretzel twists on each triangle near corners for antlers. Bake 7 to 11 minutes or until set. While warm, lightly press 2 chocolate chips into each cookie for eyes and 1 cherry half for nose. Remove from cookie sheets. Let stand until chocolate chips are set, about 15 minutes. Store between sheets of waxed paper in tightly covered container.